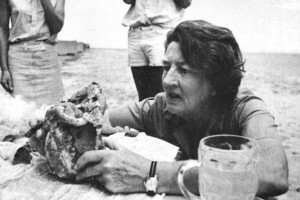 Mary Leakey. Image from ibnlive.in.com. Mary Douglas Nicol was born in February of 1913. Her father was a landscape artist, which led Mary to spend much of her childhood in Europe where he painted ‚Äì notably in the Dordogne and Les Eyzies, regions rich in prehistoric art and archaeological sites. Mary‚Äôs father died when she was thirteen, and her mother moved the family back to London. Mary didn‚Äôt do well in school ‚Äì in fact, she was expelled from two Catholic schools! But in 1930, she found her passion. She audited classes in archaeology and geology at university and began working on archaeological digs and as a scientific illustrator. In 1933, she met Louis Leakey, an anthropologist, at Cambridge. They were married in 1936 and Mary began to work with him in his excavations in Kenya and Tanzania. Mary made many important discoveries during her career as an archeologist. Her first notable discovery was the first fossil skull of the extinct Miocene primate Pronconsul. In 1959, she discovered ‚ÄúZinjanthropus‚Äù ‚Äì the fossil that propelled the Leakey‚Äôs to international fame. She lived almost full-time at their primary excavation site of Olduvai Gorge, often while Louis traveled and worked on other projects. In 1974, she commenced excavations at Laetoli. Her discoveries included a number of animal footprints that had been fossilized in ash deposited by a volcano. Four years later, her team found one of the most famous discoveries about prehistoric times: a series of adjacent footprints left by two bipedal hominids (possibly ancestors of modern humans) dated to 3.6 million years ago! Although she never earned a degree, Mary‚Äôs contributions to the field of archaeology and human prehistory have been some of the most important to date. Her decades-long excavations revealed much about human origins ‚Äì and continue to be primary influences on our understanding of the origins of modern humans. 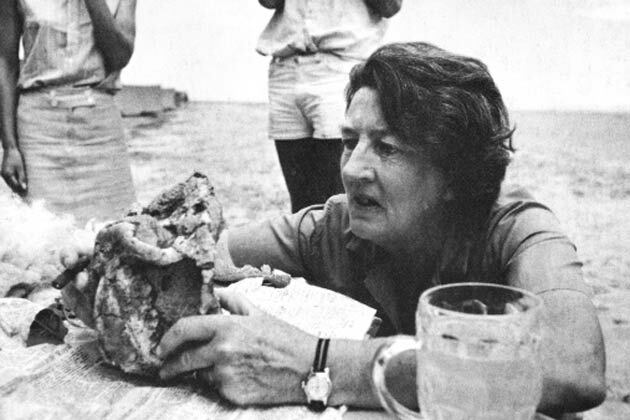 You can read an interview with Mary Leakey at Scientific American.